The public is invited to bring their old documents containing personal and confidential information to be shred on the spot at no charge. Paper documents should be removed from binders prior to shredding; however, staples, paperclips, CDs and floppy discs are okay to be shredded. 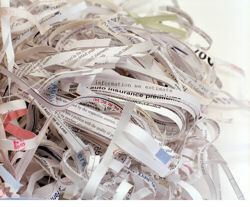 Shred-It, the world's leading document destruction and recycling company, is providing the shredding equipment. The first 1,000 people who take advantage of SDCCU’s free shredding services this Saturday will receive a free gift. Plus, there will be free food and donations will be collected for the San Diego Humane Society. Since 2007, when SDCCU began hosting its free Shred Day events, more than 476,545 pounds of confidential, sensitive paper documents have been shredded and recycled, saving approximately 4,698 trees. Qualcomm Stadium in San Diego’s Mission Valley area is home to the San Diego County Credit Union Poinsettia Bowl, the only college football bowl game among the 35 college football games to have a credit union as a title sponsor. The ninth annual game is set for Thursday, Dec. 26, 2013.